I finished the second half of the RV Driving Safety course this morning. It was well worth the time spend. Did you know that in the event of a blow-out you should press the accelerator and not the brakes? Did you know that the date of manufacture is on the sidewalls of your tires? If you buy a new RV, it may have sat for 2 years, the chassis is still a year older, so the tires could be 3 years old. The life of a tire is 5-6 years so you are not getting the bargain you may have thought you were getting. After the course I attended the Forest City Rotary Club meeting and met a former CEO of Winnebago. The speaker was from an Iowa shortline railway company which bought an abandoned railway line 10 years ago and is now growing at 25% per year carrying corn, ethanol and windmill generator parts. They have 21 engines and trains with 5 engines and as many as 140 cars long. They make up the trains which are then handed over to Union Pacific that that hauls the ethanol to Los Angeles. After Rotary I studied various new motor home configurations and concluded there is not any significant advantage to the new ones that would justify switching. In the afternoon each of the state groups had parties along the road. 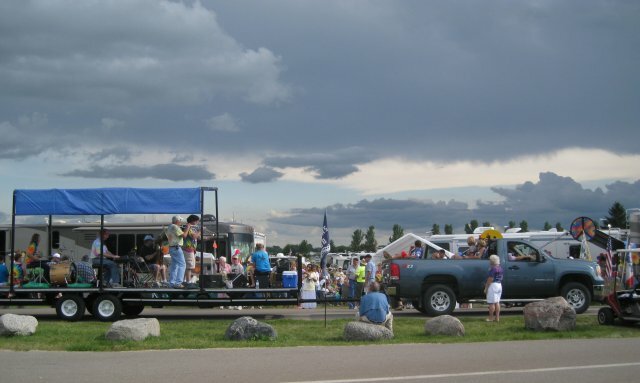 The sky was unusual and bands entertained from trailers (see photo).